Good value. Lenovo is asking for around 550 Euros (~$738) for a Windows tablet with a Core i3 processor, Full HD IPS display, a "real" SSD (not eMMC) and a keyboard dock. Is the exceptionally low price Lenovo's declaration of war against the competition, or is it the only way the company could think of to entice potential buyers? Our review reveals the answer. We reviewed the Lenovo Miix 2 10 (Atom Z3740D, HD Graphics (Bay Trail)) a few weeks ago -- now all we have left is its 11-inch sister model, the Miix 2 11. 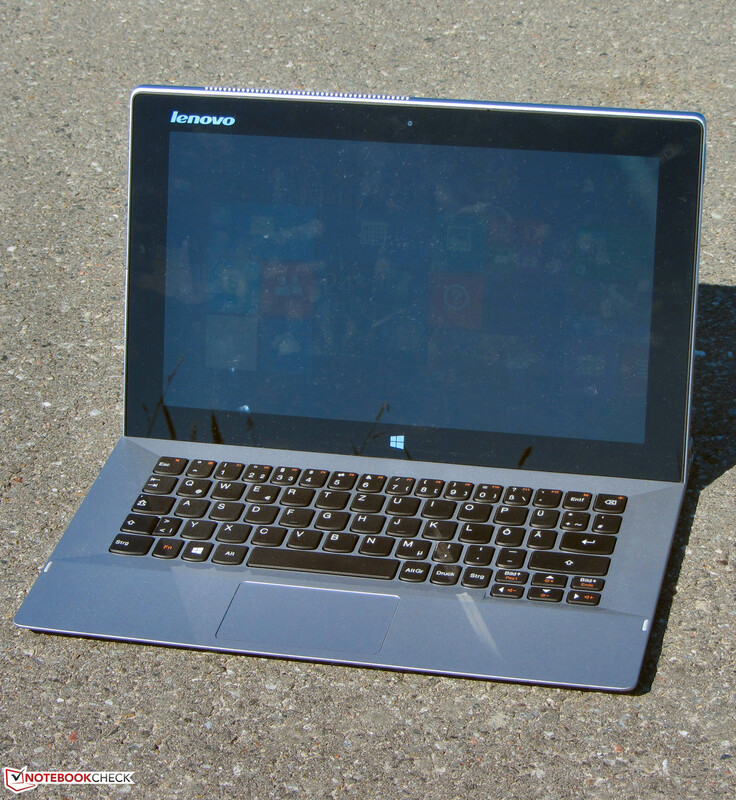 Both devices are complete Windows tablets, and each comes with a keyboard dock. Externally, the two devices look the same. But when it comes to their technological inner workings, there are a few big differences: While the Miix 2 10 runs on an Atom processor, the devices in the Miix 2 11 line are equipped with Core processors. 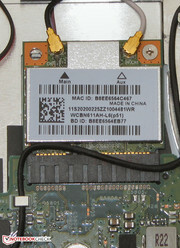 The Miix 2 11 also has an mSATA Solid State Drive, whereas the Miix 2 10 comes with eMMC storage. In addition, only the Miix 2 11 runs the 64-bit version of Windows 8.1. 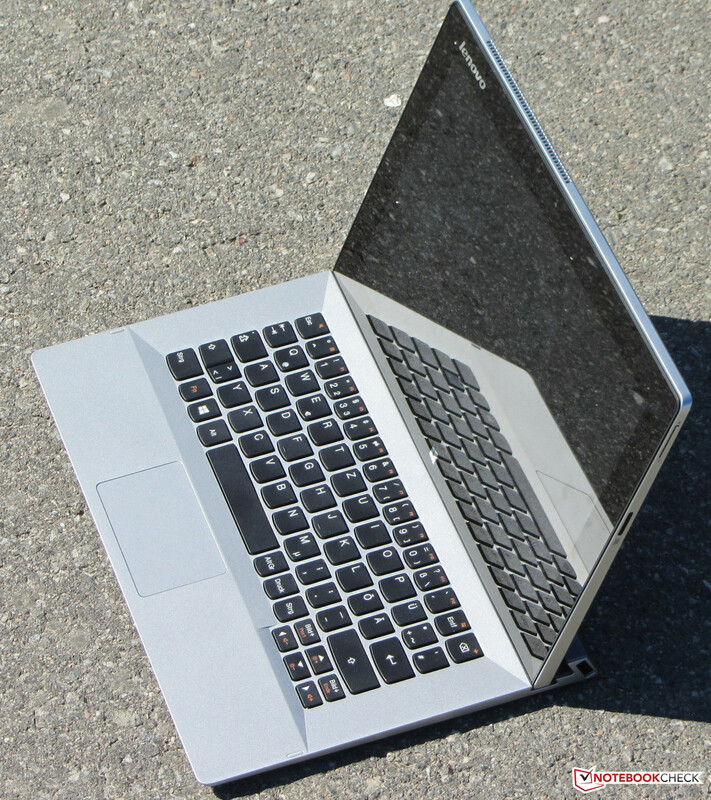 Can the 11-inch version earn our recommendation? Read on to find out. In principle, all other 11.6-inch convertibles as well as subnotebooks of the same size constitute competition for the Miix 2 11. 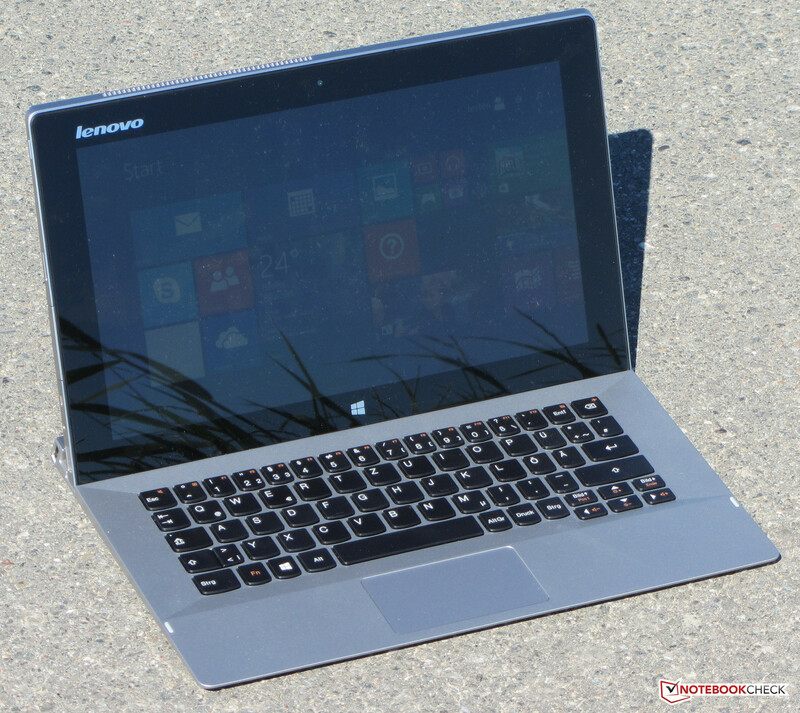 Due to the Miix 2 11's low price, however, comparable convertibles are not so easy to find. Corresponding devices from other manufacturers cost considerably more and/or are equipped with weak Bay Trail processors. For this reason, we will use the Dell Tablet Venue 11 Pro (Core i3-4020Y, HD Graphics 4200) as our main device for comparison. While the Dell tablet is considerably more expensive than the Miix 2 and does not come with a keyboard (though one can be purchased separately), the Venue 11 is outfitted with a Core processor and thus serves as a good model for comparison. There is no use in looking for high-quality materials like aluminum or magnesium on the Miix 2 -- the device's case is constructed entirely out of plastic. The tablet comes in a silver-gray color. The only exception is the back side, which is tinted a darker gray. 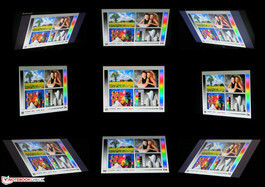 In both form and color, the device essentially mirrors its sister model, the Miix 2 10. The tablet feels solid, though the keyboard dock has its weaknesses: It is very easy to twist, and the plastic to the left and right of the keyboard as well as the stand base yield under pressure. The keyboard dock that comes with the tablet is not your ordinary keyboard. It also enables the device to function in a variety of "modes." 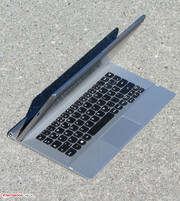 In notebook mode, as the name suggests, the tablet can be used like a notebook. Stand mode allows the user to watch video content on the tablet without having to hold the device. For transport, Lenovo created a "closed notebook mode," so to speak. 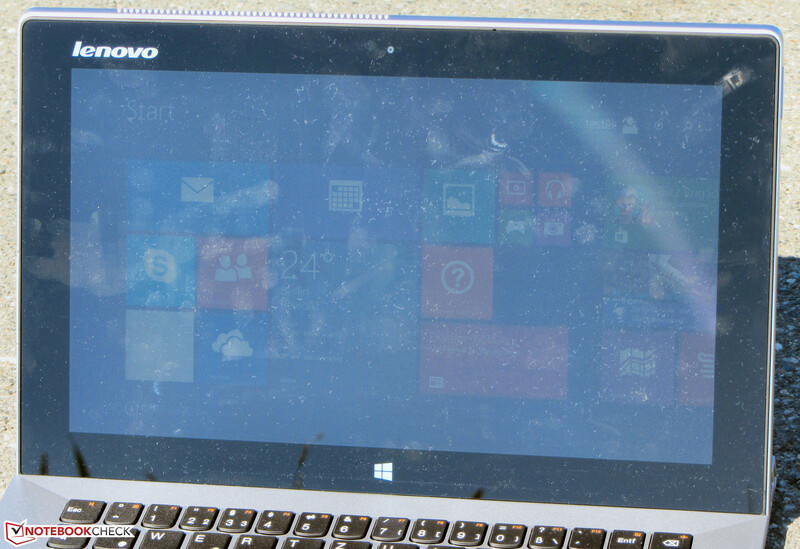 Here, the tablet lies on top of the keyboard, and the device looks like a notebook. 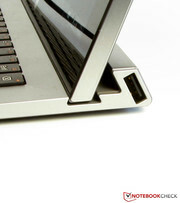 In all these modes, the connection between the tablet and the docking station is established with magnets. 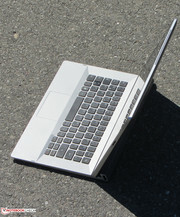 The keyboard includes two USB 2.0 ports and a subwoofer. An extra battery is not built in. The Miix 2 does not offer a plethora of connections. Good: The tablet is outfitted with a normal USB port (not mini or micro USB) that simultaneously serves as the connection to the power supply. 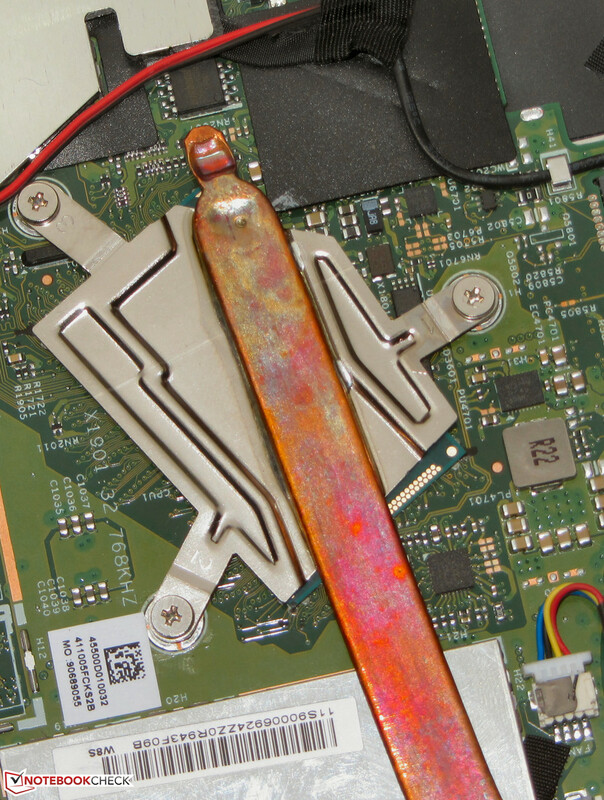 According to Lenovo's website, this is a USB 3.0 port. 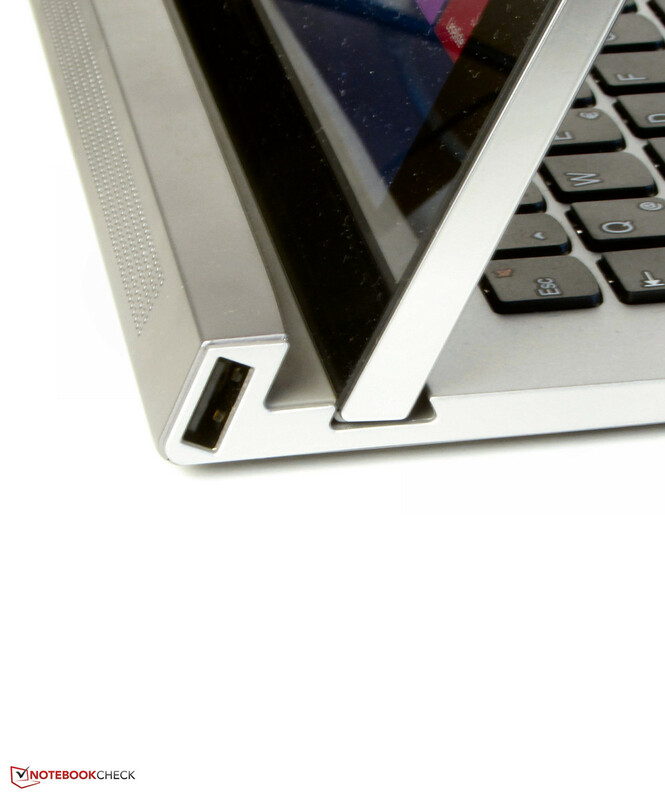 Two more USB 2.0 ports are located in the keyboard dock. 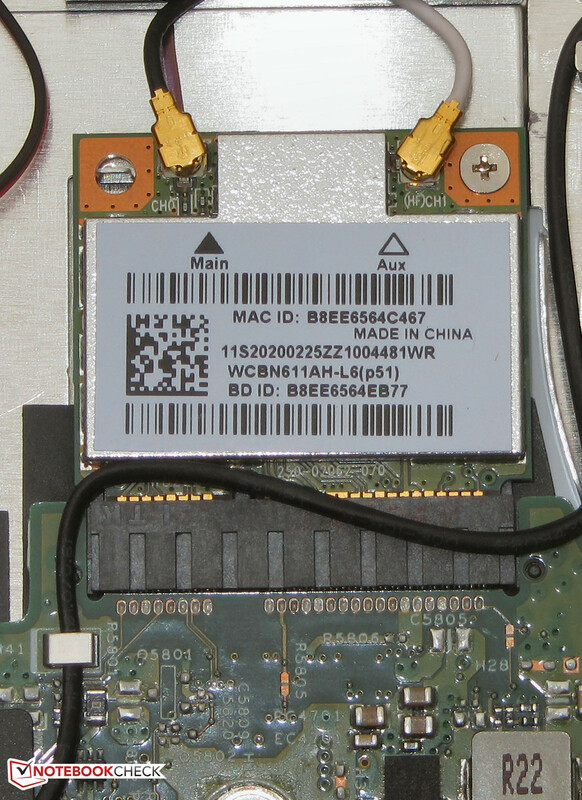 An Atheros WLAN chip is responsible for connections to the outside world. It supports the WLAN standards 802.11 b/g/n. In our tests, the connection with the router was stable and always functioned without a problem (in a radius of 15 meters from the router). A Bluetooth 4.0 module found its way into the device as well. The Miix 2 is also available with an integrated 3G modem, though our test device came without it. The Miix 2 comes with very simple companions: A quick-start guide and warranty information. Windows 8.1 (64-bit) serves as the convertible's operating system. A recovery DVD is not included. The Miix 2 does not offer a maintenance hatch. 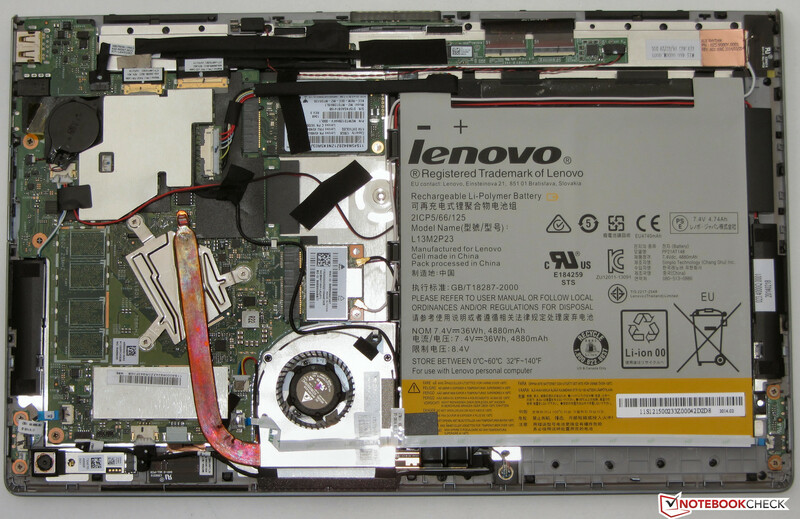 However, the hardware handbook Lenovo included with the device reveals that the backside of the tablet can be removed with a small, thin pry bar. We tried it and determined that the backside can be taken off relatively easily with a putty knife. This must be done carefully, as the positioning clips could easily break. 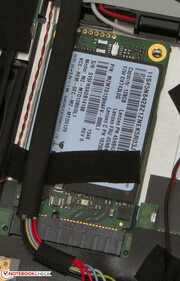 After opening the case, the BIOS battery and WLAN module are immediately accessible. The Solid State Drive can also be switched out. 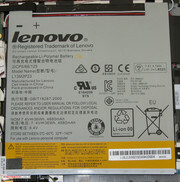 The SSD Lenovo installed is a standard mSATA model. 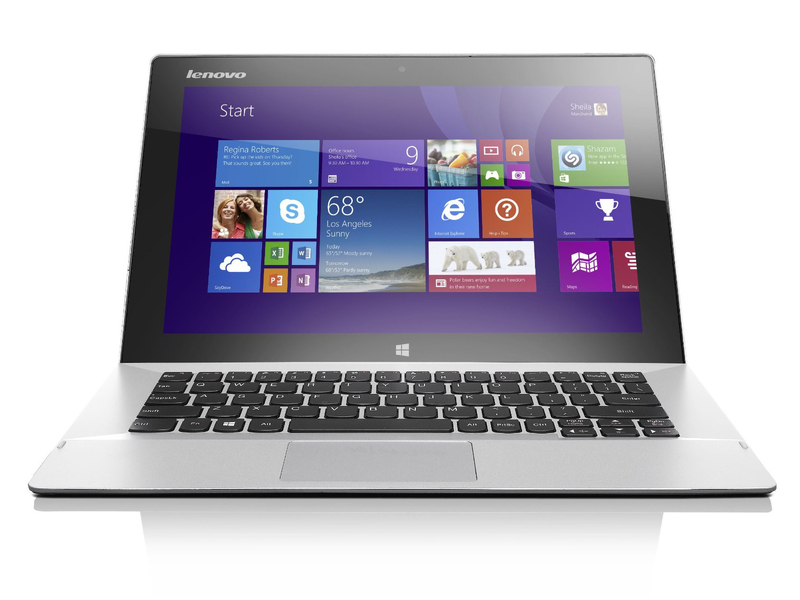 Lenovo outfits the Miix 2 with a 2-year warranty. Buyers of the Venue 11, however, will have to be content with just a 12-month warranty. At the time of writing, we could not find any warranty extension options for the Miix 2 on Lenovo's website. Lenovo equipped their Miix 11 2 with two cameras. The front camera offers a resolution of 2 megapixels and is only sufficient for snapshots or video chats. 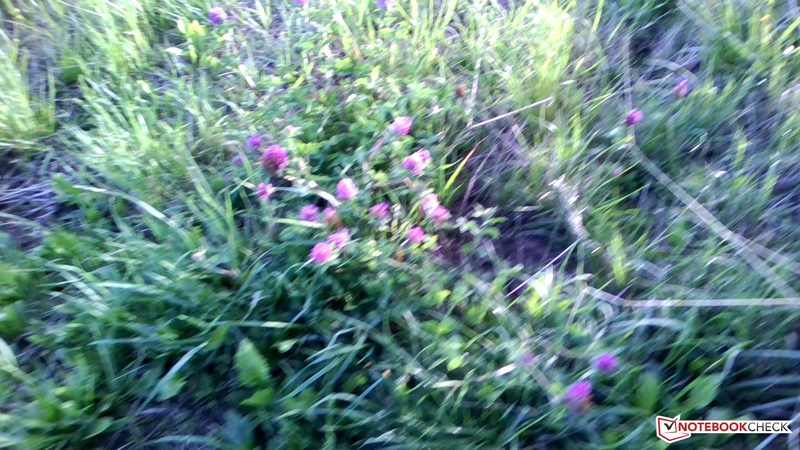 We had trouble holding the device still enough to take sharp photos with this camera. The camera on the backside has a resolution of 5 megapixels and actually produces respectable photos, though they have a blue cast. 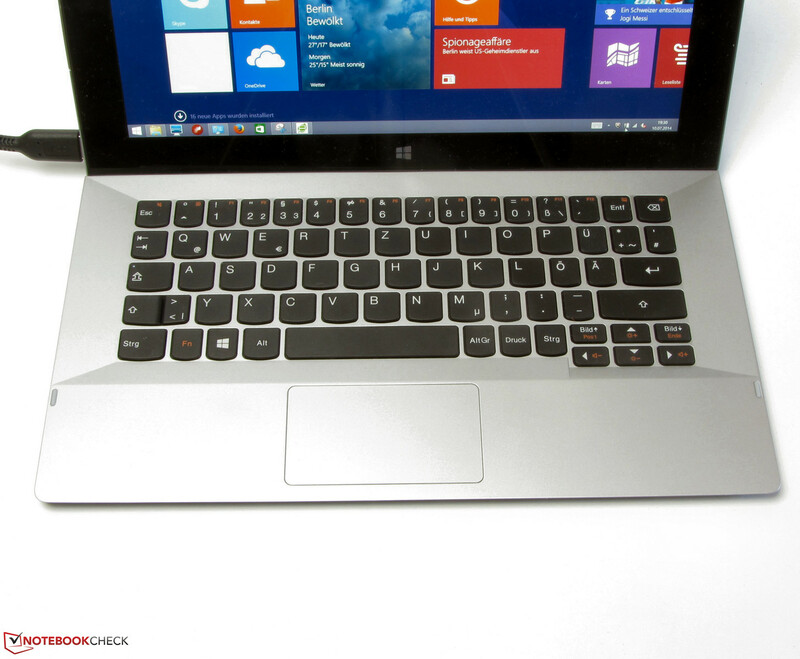 The keyboard dock houses a chiclet keyboard in the familiar Lenovo design. The keyboard is not backlit. Because there is limited space on the dock, not every key is in its usual place; for instance, the "Delete" and "Backspace" keys are located directly next to each other. 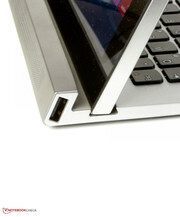 The flat and smooth keys have a short travel length and a clear click point. Nevertheless, the latter could be a little crisper. During typing, the keyboard yields a little under the force of fingers hitting the keys, but overall it allows for fluid typing. However, the Miix 2's keyboard is no match for an excellent notebook keyboard -- for instance that of the (11.6-inch) Lenovo ThinkPad Edge E145. 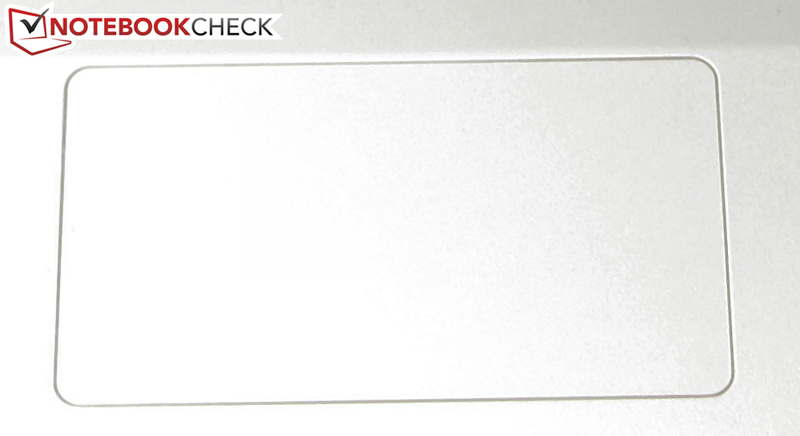 A small ClickPad (a touchpad without separate mouse keys -- the whole pad is a key) measuring 8 x 4.5 cm (~3.1 x 1.8 inches) also found its way onto the keyboard dock. The slightly roughened surface does not hinder the finger's ability to glide across the pad. The ClickPad does not support multitouch gestures, nor is there a configuration menu for the input device. The pad has a short travel length and a clearly audible and palpable click point. 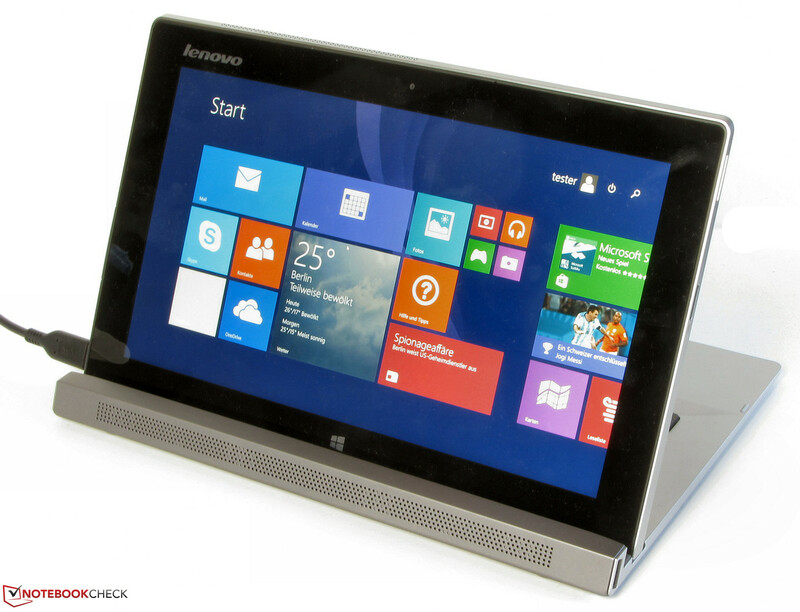 The 10-finger touchscreen Lenovo installed in the device functions flawlessly. The screen responds to inputs promptly and fluidly. The touchpad does not support multitouch gestures. The Miix 2 is outfitted with an 11.6-inch display with a native resolution of 1920x1080 pixels. 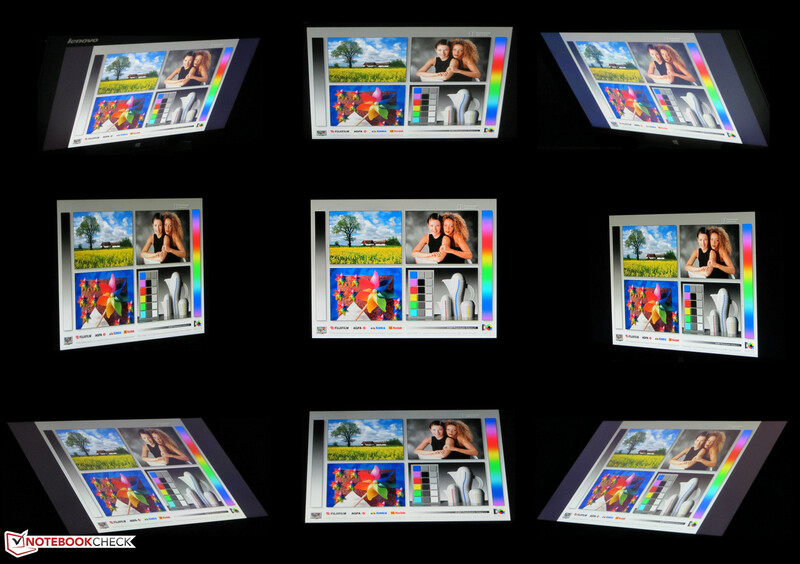 At a display brightness level of 327.4 cd/m², the Miix 2's display is easily visible. Still, the Venue 11 can trump this good number (369.7 cd/m²). In terms of contrast (860:1) and black value (0.4 cd/m²) too, the Miix 2's panel cannot be criticized. The Venue 11's numbers here are more or less on par with our review device's (909:1, 0.45 cd/m²). 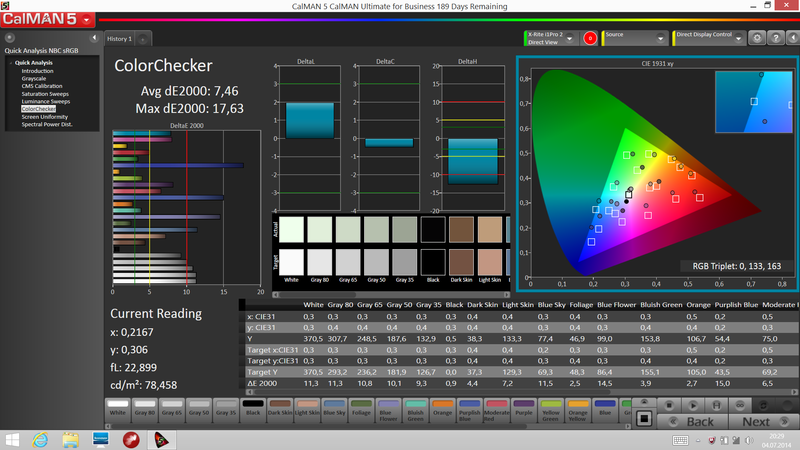 We cannot make a statement regarding the Miix 2's color space coverage, as our measuring device refused to be calibrated. Out of the factory, the display's average DeltaE 2000 deviation is 7.46. 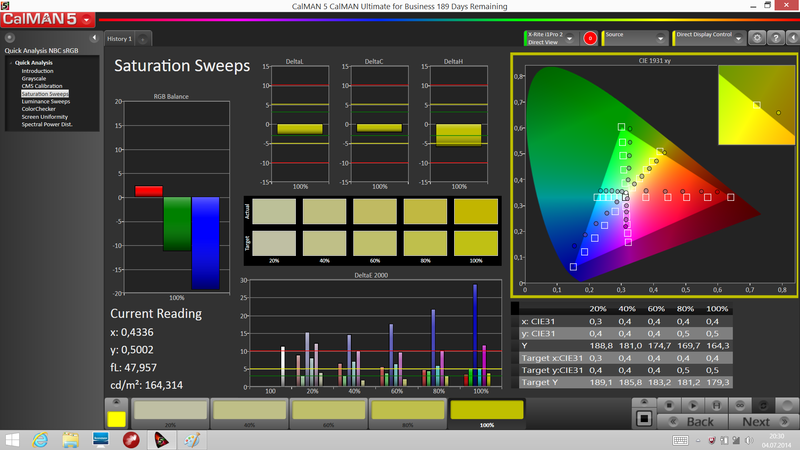 At that number, the panel does better than the majority of displays we have tested. 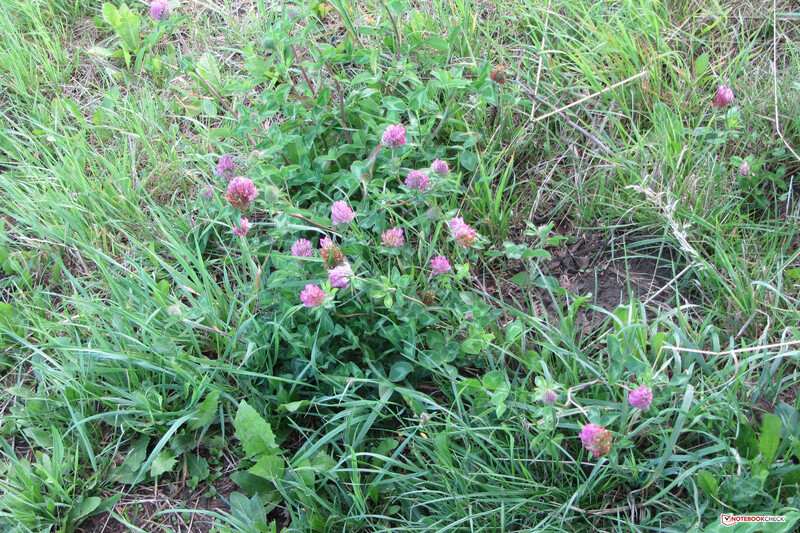 Some colors even land in the target area (DeltaE less than 3). The display does not have a blue cast. Lenovo equipped their Miix 2 with an IPS panel. That means users of this convertible will not have to contend with limited viewing angles and will be able to read the display from practically any perspective. Despite its strong brightness and high contrast, the Miix 2 is almost unusable outdoors -- the display's reflective surface is too hindersome. The Miix 2 is an interesting option for anyone who is looking for a complete Windows tablet but does not want to go without a physical keyboard. The device's computing power is sufficient for any everyday task. 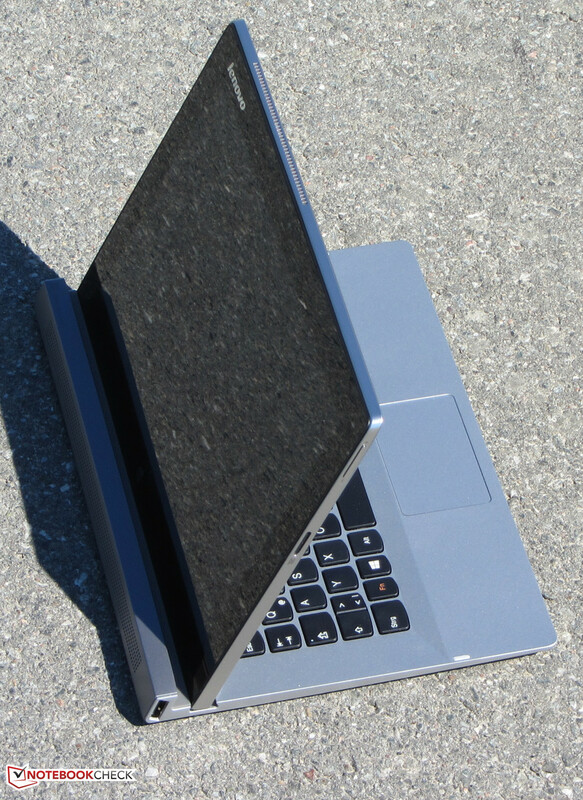 Our test device is currently on the market for about 550 Euros (~$738). Versions with different components are available. The Miix 2 runs on an Intel Core i3-4012Y processor. This Haswell generation CPU is outfitted with two cores and has a clock frequency of 1.5 GHz. There is no turbo, but the CPU supports Hyper-Threading (each core can process two threads). According to Intel, the processor's TDP is 11.5 Watts. To test whether the CPU can utilize its full performance capabilities, we ran the Cinebench benchmarks on the device. The processor's full performance was only available for single-thread applications -- the CPU completed the multi-thread tests at 900 to 1000 MHz. The processor behaved identically in both AC power mode and battery mode. 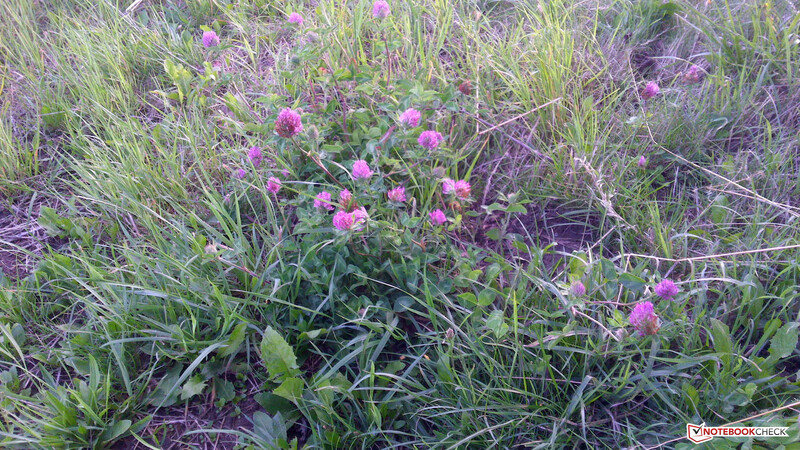 The system always runs sturdily and fluidly. Windows starts quickly. Even so, the results in the PCMark benchmark tests were lower than we expected. The reason for that was not hard to determine: Both the CPU and the GPU seldom work at their full speed. 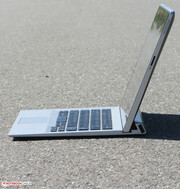 A few weeks ago, we reviewed the Toshiba Convertible W30t-A-101, which is outfitted with a Core i3-4020Y processor. This CPU is almost completely identical to the Core i3-4012Y. The only difference is that the 4020Y consumes a little more power under a typical level of load. Despite having the same CPU, the W30t achieved better results than the Miix 2 in the PCMark 8 benchmarks. However, the Miix 2 is the clear winner in the PCMark 7/Vantage benchmarks. The reason: Unlike the W30t, our review device is equipped with an SSD. 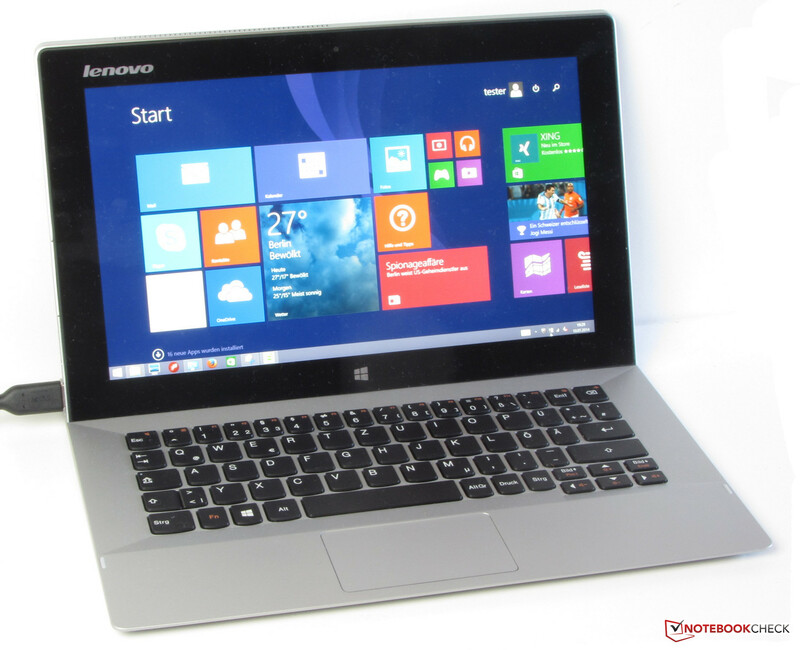 This gives the Lenovo convertible an enormous advantage in the PCMark 7/Vantage tests. If the W30t was outfitted with an SSD, it would come in ahead in these benchmarks too. The Miix 2 comes with a Solid State Drive manufactured by Samsung. The SSD offers a capacity of 128 GB, though only 107 GB remains available to the user. The rest of the storage space is reserved for system recovery. Overall, the SSD's transfer rates are good, though it cannot keep up with the current top model SSDs. An Intel HD Graphics 4200 graphics core also makes its home in the Miix 2. The GPU supports DirectX 11 and runs at speeds of between 200 and 850 MHz. The 3DMark benchmark results also proved to be considerably lower than what the convertible's hardware ought to be capable of. The graphics core does not run at full speed. Our diverse benchmarks show that neither the processor nor the graphics core are able to utilize their full computational power very often. As a result, the Miix 2's frame rates during gaming clearly fall short of the convertible's theoretical capabilities. Even a game like Dirt 3, which runs fluidly on other devices with HD Graphics 4200 GPUs, is practically unplayable on the Miix 2. 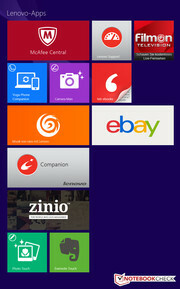 Individual games that were designed for the Windows 8/8.1 user interface can be played on our review device. The Miix 2 is equipped with a fan. Nevertheless, the device could be referred to as silent. Even during our stress test, the fan could only be heard in very quiet environments. But the low rotating speed also has negative consequences -- consequences we ran into over and over again during our tests: The CPU and GPU rarely or never perform at their full speeds. If possible, Lenovo should ameliorate this problem with a BIOS update. The fan could certainly spin faster. Alternatively, Lenovo could let the user choose which they prefer: for the device to run quietly, or for the device's full computational power to be available. The Miix 2 did not warm up excessively in our tests. During our stress test, the case temperature just barely crossed the 40 °C (104 °F) line in one of the spots we measured. Looking at the CPU and GPU speeds, it quickly becomes clear why the device does not warm up very much in the stress test (Prime95 and Furmark running simultaneously for at least an hour). The CPU runs at 600 MHz, and the graphics core does its work at 200 to 400 MHz. These components behave the same in both AC power mode and battery mode. During the stress test, the CPU temperature leveled off at around 50 °C (122 °F). (+) The maximum temperature on the upper side is 35.3 °C / 96 F, compared to the average of 35.4 °C / 96 F, ranging from 21.8 to 55.7 °C for the class Convertible. The Miix 2's two JBL speakers are located on either side of the tablet. A subwoofer that resides in the keyboard dock also joins their ranks. This combination produces a surprisingly good sound -- a sound one could easily listen to for an extended period of time. Without the support of the subwoofer, the sound is a little thin. A pair of headphones or external speakers could provide a higher quality sound. 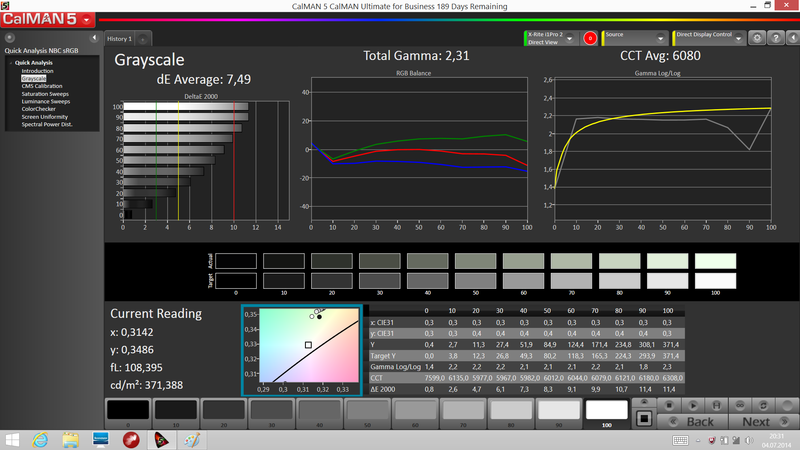 In idle mode, the Miix 2's energy consumption rate is very low -- as per usual with devices outfitted with Haswell CPUs. Under load as well, the convertible's energy use is reasonable. 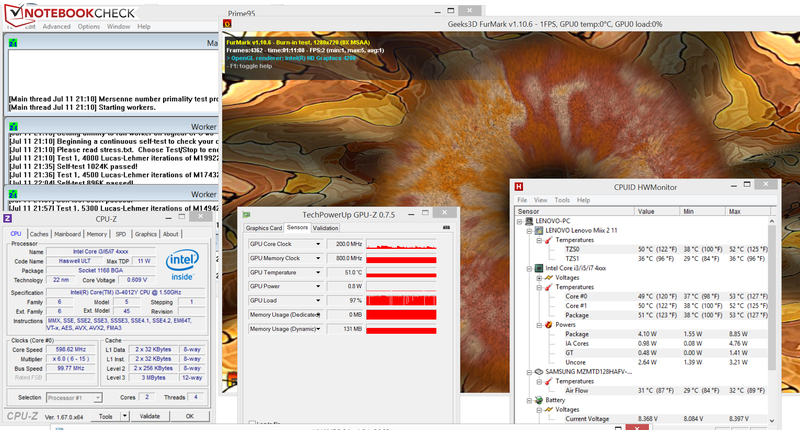 Interestingly, during the stress test (Prime95 and Furmark running simultaneously), the device's power usage is lower than under medium load (3DMark06 running). The reason: In the stress test, both the CPU and the GPU function at very low speeds. In idle mode, the Miix 2's battery keeps chugging along for 11:22 h. The Venue 11 (12:42 h) offers a little more stamina here. We test a device's battery life in idle mode with Battery Eater's Reader's test: The display is set to the lowest brightness setting, the energy-saving profile is active, and the wireless modules are turned off. Under load, the Miix 2 cuts out after 3:22 h. The Venue 11's battery conks out earlier (2:03). We determine a device's battery life under load with the Battery Eater Classic test: The display runs at maximum brightness, and both the high-performance profile and the wireless modules are activated. The Miix 2 ends the WLAN test after 4:44 h. Once again, the Venue offers a substantially longer battery runtime (6:42 h). In this test, websites load automatically per script in 40-second intervals. The energy-saving profile is active, and the display brightness is set to about 150 cd/m². We test a device's battery life during video playback by running the short film Big Buck Bunny (H.264 encoding, 1920x1080 pixels) on constant repeat. The energy-saving profile is active, the wireless modules are deactivated, and the display brightness is set to around 150 cd/m². The Miix 2 holds out for 5:15 h. We did not perform this test on the Venue. 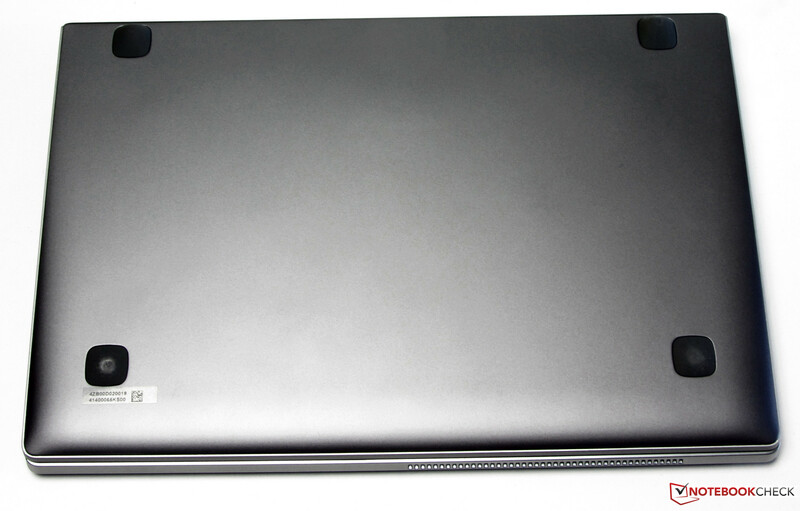 The Lenovo Miix 2 11. 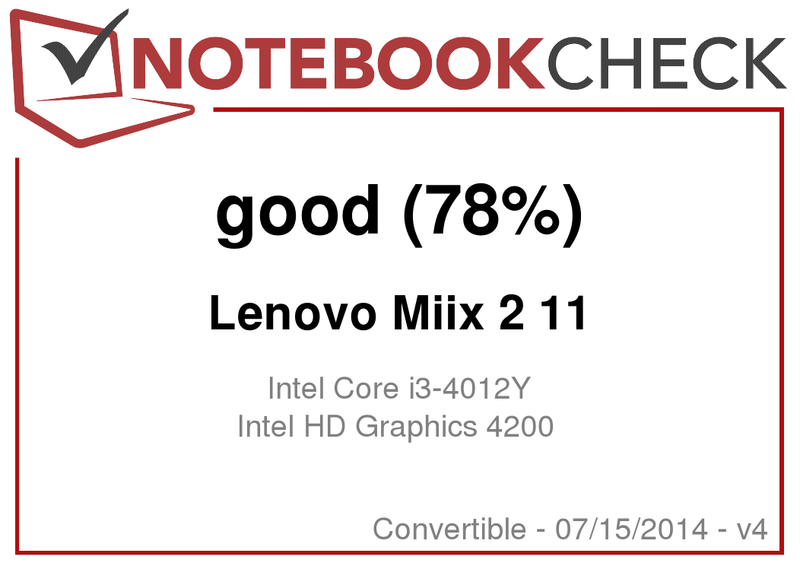 Fundamentally, the Lenovo Miix 2 makes a reasonably good impression. 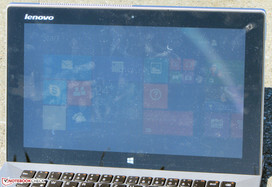 At a price of about 550 Euros (~$738), the buyer gets a complete Windows tablet with a connectable keyboard. The latter is absolutely sufficient for practical, everyday use. We have definitely typed on considerably worse tablet keyboards. Alongside two USB 2.0 ports, the keyboard dock also houses a subwoofer. The convertible's sound certainly profits from the added component. 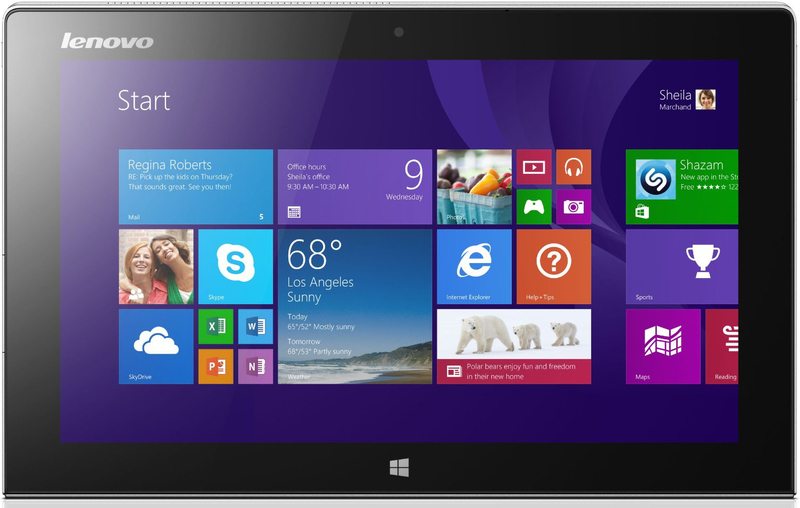 The tablet is outfitted with a good Full HD IPS panel and a quick Solid State Drive. Once purchased, the owner of a Miix 2 could switch out the SSD for a faster model and/or a model with greater storage capacity. Unfortunately, the tablet's Core i3 processor cannot always provide its full performance power. It appears that the device cannot cool itself enough here. However, the tablet's performance is absolutely sufficient for all the everyday tasks it was created for. We consider the device's limited working memory (2 GB) more of a bottleneck in this case. As a general rule -- this applies to the pricier Miix 2 11 models too -- Lenovo should equip their devices with 4 GB of working memory. The Dell Venue 11 Pro represents an alternative to the Miix 2 11, though it is considerably more expensive, and the user would have to buy a keyboard separately. The greatest advantage of the Venue 11 is its substantially better battery life, which could be extended even further if it was connected to a keyboard equipped with an extra battery. 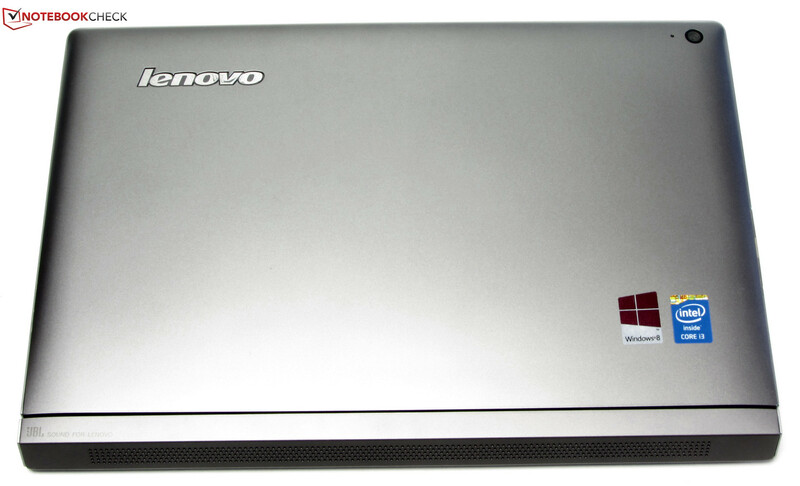 As an alternative to the two tablets, we do not want to neglect to mention the Lenovo ThinkPad Edge E145 notebook. 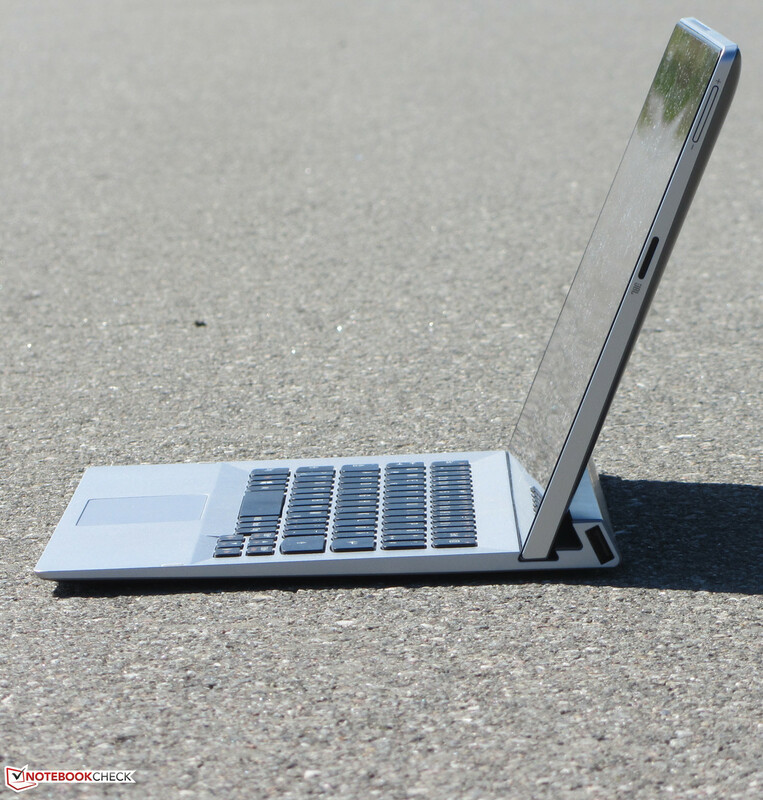 This notebook is ideal if you are primarily seeking a mobile 11.6-inch device for writing purposes. The ThinkPad has a leg up on the Miix 2 and the Venue 11 in this capacity, as it offers a considerably better keyboard and a longer battery life. In addition, it is currently available for just 370 Euros (~$500). 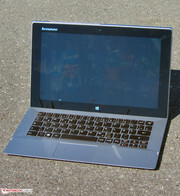 When closed, the Miix 2 looks reminiscent of a notebook. The case can be opened. The CPU is soldered in place. 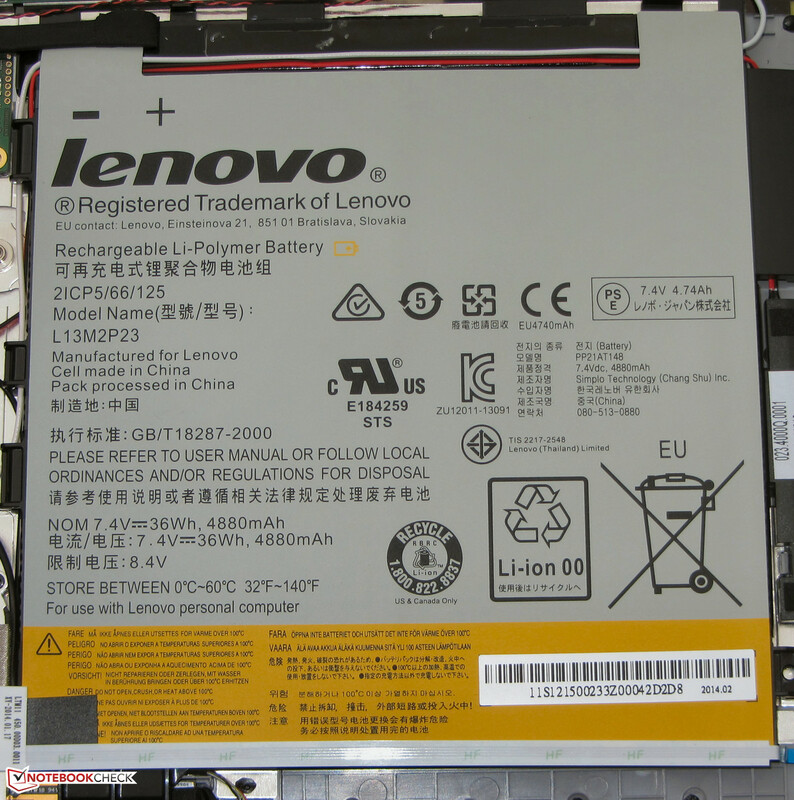 Lenovo selected an mSATA SSD for their tablet. Good: The device has two WLAN antennae. 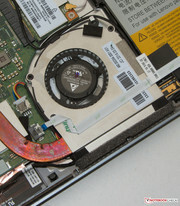 It would be possible to switch out the BIOS battery. The battery offers a capacity of 36 Wh. The bright, high-contrast IPS panel. The CPU and GPU rarely or never maximize on their full performance capabilities. 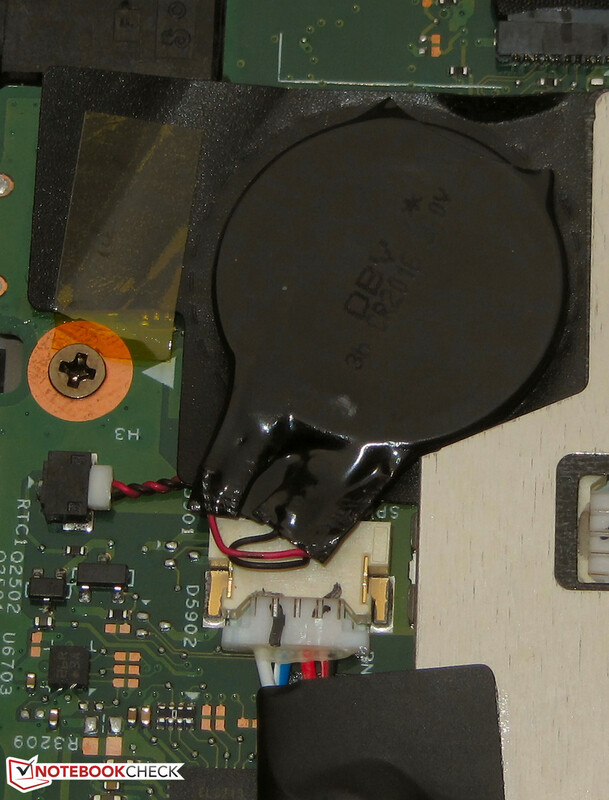 It seems that despite the fan, the tablet's cooling capacity is simply not sufficient. Dell Venue 11 Pro, HP Pavilion 11-n070eg x360 convertible, Asus Transformer Book T100TA-C1-GR convertible, Sony Vaio Fit 11A multi-flip SV-F11N1L2E/S convertible, Lenovo IdeaPad Yoga 2 11 convertible, Acer Aspire V5-132P notebook, Lenovo ThinkPad Edge E145 notebook, Lenovo IdeaPad S215 notebook.